Max loves his tubby time!! 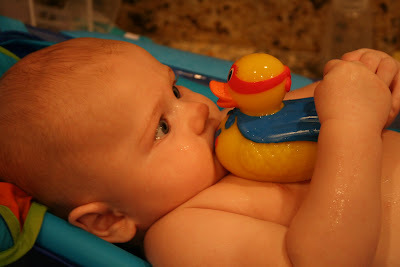 As you can see our little super hero rubber ducky that makes sure the water is not too hot loves it too! He has a big M on his front. So I had to get him for Max. I love washing him, snuggling him up in his towel, q-tipping his ears, rubbing lotion on him, kissing his little naked tummy, putting nice powder fresh diaper on him and then buttoning him up in his cute little pajamas. I need to enjoy this time now because I'm sure the time will come when I will be begging him to take a shower. You know when they start to have B.O. and want to wear the same thing everyday. Why does my baby have to grow up? The thought of hormones, girlfriends, Not cool to be hugged and kissed by your mom! Yes, I will be enjoying every minute of this time when I can hug and kiss him all I want! !